Preparations for the launch of the NASA Juno mission to Jupiter are proceeding well, as the mission passed through its Flight Readiness Review (FRR). 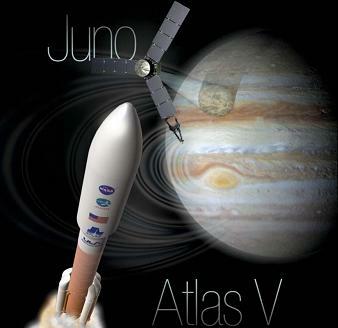 Juno will be riding on the United Launch Alliance (ULA) Atlas V, a vehicle which arrived on an Antonov An-124 for the final time, as Atlas’ began sharing a ride on the Delta Mariner – a ship which recently completed a dual shipment, carrying both Atlas and Delta stages to Florida for future missions. The $1 billion NASA mission will see Juno placed into a polar orbit of the largest planet in our solar system, following a five year journey from Earth. Built by Lockheed Martin, Juno will investigate the planet by orbiting Jupiter’s poles 33 times – at 160,000 km per hour, making it the fastest man-made object in history – to find out more about the gas giant’s origins, structure, atmosphere and magnetosphere. The 8,000-pound solar-powered spacecraft will deploy eight scientific instruments, with key electronics placed inside an armoured vault, in order to protect them against Jupiter’s deadly radiation. The instruments will determine how much water Jupiter holds, a key factor in finding out how the planet was formed. With of the interplanetary expedition set to begin on August 5 from SLC-41 at Cape Canaveral – with a window ranging from 11:34am to 12:43pm Eastern – the mission is in the business end of the launch preparations, which included the successful Flight Readiness Review (FRR). “The Juno FRR was held, with Board concurrence given to proceed with processing towards August 5th launch date. No actions were issued,” noted flow notes (L2). Integrated Systems Test (IST) has also been completed after the resolution of some minor anomalies, while power-on testing of the spacecraft is set to be completed on Monday. Launch managers will meet on Monday morning, which will be followed by a Mission Dress Rehearsal (MDR). Managers will also be keeping a close eye on the weather, with forecasts noting a large tropical wave has the potential to threaten the Florida coastline as a tropical cyclone – although such a threat is unlikely to affect the initial August 5 launch attempt. The launch vehicle tasked with sending Juno uphill is the ULA Atlas V, in the 551 configuration – the most powerful set up ever used for the vehicle which is also being touted for a manned role via NASA’s commercial missions to the International Space Station (ISS). The vehicle consists of the Atlas V booster stage, the Centaur upper stage, five solid rocket boosters (SRB), and a 5-meter payload fairing (PLF). The booster arrived via an Antonov An-124 plane transport. However, the Atlas’ are now sharing rides on the Delta Mariner from the production facility in Decatur, Alabama – a debut conducted for the most recent arrival to Florida; the Atlas V booster set to launch the Mars Science Lab (MSL) mission for NASA in November. For this recent sea journey, the booster became the companion of a Core Booster Stage (CBC) for the Delta IV launch vehicle scheduled to launch the Wideband Global Satcom (WGS)-4 mission for the US Air Force. 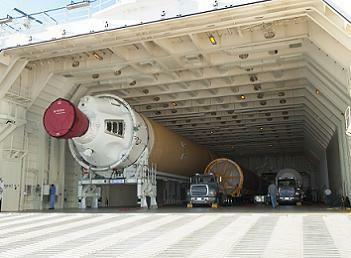 The Mariner also shipped two second stages, as well as a Delta IV Payload Attach Fitting and Fairing. The Delta CBC has already endured an eventful trip, after the trailer it was riding on was struck by an electrical arc from a power line, during its ride out of the Decatur factory to the Mariner. It is understood the new power line was built lower than a previous line which had been destroyed by a tornado. The Alabama power company has since raised the lines back to the previous height. Reviews into the health of the CBC have shown no anomalies associated with the event – although testing will continue at Cape Canaveral – leading to the decision to ship the stage in order to maintain schedule for its Atlas ship mate. If – in the unlikely event – a problem is found with the Delta CBC during testing in Florida, the booster will be returned to Alabama on the Mariner’s return journey. The Mariner – which is capable of carrying up to three common booster cores on the 2,100 mile journey – was originally designed to carry Delta IV hardware from the production plant in Alabama to the launch sites, while the Atlas hardware was delivered from its production facility in Denver, to the launch sites by aircraft. This changed in 2009, when the Atlas V production line was consolidated in Decatur, leading to ULA evaluations into common transportation options for both vehicles and the potential cost savings.